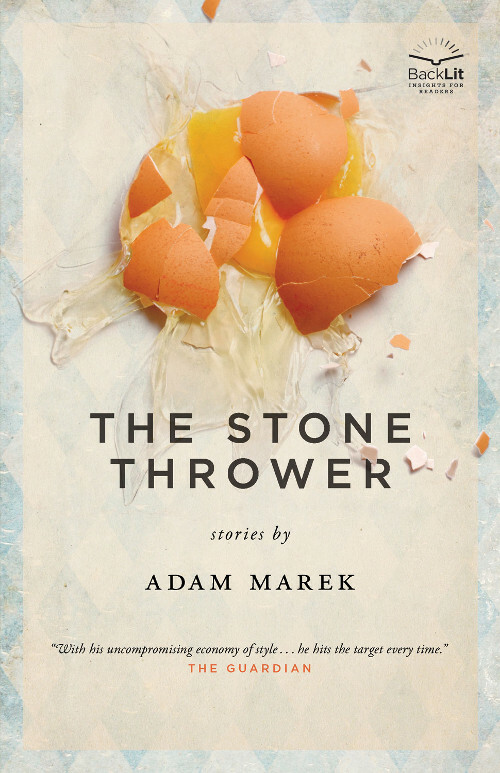 The Stone Thrower, by Adam Marek. Toronto, Ontario, Canada: ECW Press, 2013. 180 pages. $14.95, paper. I recently went to the wedding of a friend I’ve had for over twenty years. Mostly I did the things I do with people I know and enjoy the company of, telling and listening to stories and generally trying to let worthwhile moments be themselves. “My wife’s a shopaholic,” one of my friends who is a bit drunk tells me. He’s not doing a bad comedy routine and he’s not boring me with the minutiae of his days. All he’s trying to tell me it that his wife spends too much money on stuff they don’t need. Later, around when I have to leave for work at the bar, he shows me the time on his phone. His background is a picture of his daughter, an inquisitive looking two-year-old with his eyebrows and cheeks. My other friends pull out their phones to look at the time and I see all of them are about the same: wives kissing daughters, little brothers holding littler sisters. The background on my phone is a picture of a naked redheaded woman half-draped in an American flag. By saying this, I mean only to explain that my list of responsibilities runs short. Thankfully, The Stone Thrower is none of that. In each story there’s a hint of unknown sacrifice that’s agreed to immediately and dealt with continually throughout. I’ve barely figured out what it means to be an adult, and I may never know what it means to be a parent, but in reading the stories I understood what it means to be ready to give up something for the goal of a greater safety. Finding out along with the characters what that greater safety may be is one of the many joys of the book. Despite the complications the characters face, the prose itself and the narratives constructed are painlessly easy to digest and follow. Halfway through the book I realized how focused I became on the stories and not the sentences—certainly not my default. I love Barry Hannah and Amy Hempel and Gary Lutz to a point of absurdity, but Marek’s own focus on the story, the amplified simplicity of it all, is too beautiful to ignore. The fact that it became easier and easier to put faith in Marek as each line passed is a testament to his skill. Even when the stories appear to be, at first glance, nothing more than silly—a boy’s electronic pet gets AIDS in “Tomagotchi” and orangutans are born and raised to do high-production manual labor in “An Industrial Evolution”—Marek is just too good to not let a resolution happen in a way that is both fittingly clever and wholly satisfying. There’s a deep helplessness lingering in these stories. A growing boy deftly and subtly explains both saving baby chicks from choking on a beach with his father and the absence of his deceased mother in the minor heart-shattering opener “Fewer Things,” and from then on there’s nothing but vulnerability. There’s danger-through-improvisation and layers of protection, one person looking at an end and the other seeing only the path to the end. Often, what can be done is not enough. The AIDS of the toy in “Tomagotchi” isn’t the only disease fought—in that story alone there’s the trouble of the child’s seizures hovering over everything, explaining youthful attachment and why the father didn’t just throw away the toy and buy a new one. “A Thousand Seams” finds a mother battling on behalf of her son’s mysteriousness, electrical illness and feeling not so much better about doing the right thing, the lack of joy in struggle and the complications that arise from a newfound lack of complications. Professor Straumberg says no two Stern’s cases are the same. It’s really an umbrella term for any seizure activity that affects anything outside of the body. The strength of the effect in different children varies greatly too. Some of them make Toby’s seizures seem quite mild. There was a little two-year-old boy in the Hague whose seizures caused severe nosebleeds in everyone within shouting distance. No one knows why or how this type of epileptic seizure affects things outside of the child’s body. Professor Straumberg says we may be decades away from an answer, but within the next year or two, within Toby’s lifetime, Professor Straumberg’s research could lead to a better diagnosis and treatment. It’s vital that more is found out about Sterna’s right now. Please will you help? Another part of my buddy’s wedding reception I remember was towards the end, right after the conversation with my friend about his wife being a shopaholic. We were expressing admiration for one another in a slight way, like we would if we were boys half our age, after figuring out how settled we are into our lives. He liked my mustache, my long hair, my five bands and job at a bar. I told him that I liked them, too, but nothing compares to a family and a nice job, both of which he has. He thought about it, considered it. I thought of The Stone Thrower, my friend’s great responsibility and the wealth of love he must constantly rescue. The Stone Thrower at Amazon.com. The Stone Thrower at Powell’s City of Books. The Stone Thrower at ECW Press. Ryan Werner is a janitor in the Midwest. He is the author of the short-short story collection Shake Away These Constant Days (Jersey Devil Press, 2012). He runs the small chapbook press Passenger Side Books, is on Twitter @YeahWerner, and has a website, ryanwernerwritesstuff.com.